The goddess Minerva is portrayed in a dashing, virtuoso manner. The artist Hendrick Goltzius has created his image solely with a brush. Sometimes suggesting forms and outlines with the tip of the brush, sometimes applying heavy, graphic washings. Pure draughtsmanship, showing the artist’s creativity in all its freedom. 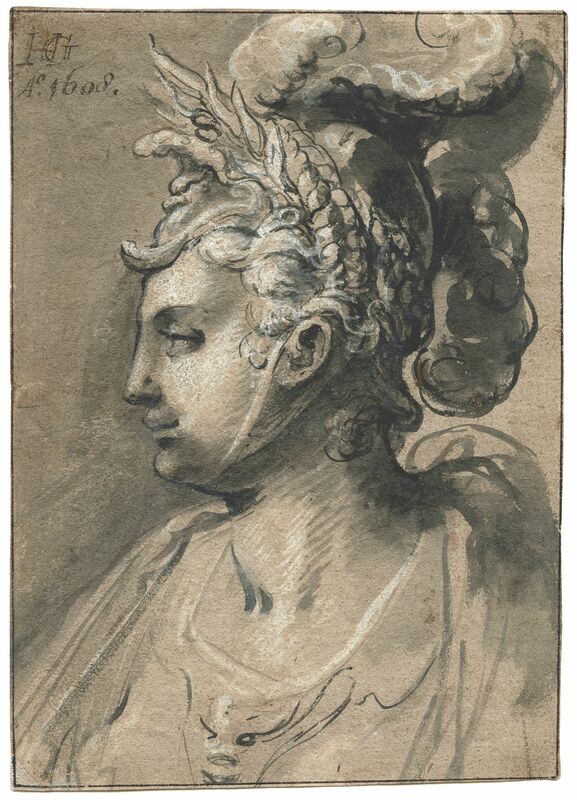 The following months Goltzius’ drawing will be at display at the exhibition 'Op weg naar de Gouden Eeuw – Hendrick Goltzius & Jacques de Gheyn II' (On the way to the Golden Age) in the Limburgs Museum in Venlo. Over thirty masterpieces from the collections of Leiden University Library, complemented with loans from Brussels, Amsterdam and Haarlem, give an impression of the work of both artists. Because of their unequaled graphical talents, they are the most prominent precursors of the great masters of the seventeenth century. The exhibition will run up to the first of March 2010. The Leiden exhibits are also available in our Digital collections.